Two weeks ago at Willowbank’s New Years Thunder event Australian Top Bike champion Chris Matheson saw significant improvements in the performance of his Nitro Voodoo V2 Top Fuel Motorcycle. Matheson had the opportunity to match-race in a nitro dual alongside Perth’s Mark Drew and despite the extreme heat and humidity, he recorded a promising elapsed time of 6.23 seconds. “Since we moved into our new billet engine program last year, we have been staring at a blank sheet with no real data to work with,” said Matheson. But we left Willowbank with a smile following a 1.09 60-foot time, which is something we haven’t seen for a while. It’s still almost a tenth of a second off our previous 1.0 best and shows we are heading in the right direction. “Now we are heading back to Sydney for championship points and hopefully more fast runs for the fans. “I’ve got to say I was very impressed with the crowd and the number of kids we saw at Willowbank. It was so damn hot and yet the fans flocked to the track and the kids had a fantastic time. “We love coming to Sydney and we are looking forward to more fun in the sun”, said Matheson. 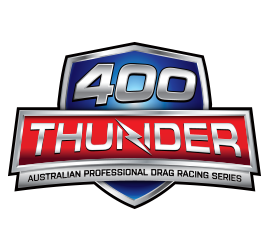 Matheson currently holds the Sydney Dragway track record and would love nothing more than to reset it providing the conditions are on his side. Having run as quick as 6.07 seconds at well over 230 mph, or almost 380 kph Matheson would like nothing better than to go quicker and faster for the championship round. Matheson currently leads the 400 Thunder Top Bike Championship with 171 points after 2 rounds. Chris Porter is 21 points behind on 150, and Mark Drew sits on 112. “Sydney is going to have some fast riders with Porter, Drew and Layton all potential winners,” said Matheson. I’d say the one to watch will be Drew who will be assisted by Jaska Salakari from Finland. Jaska is currently the quickest Harley rider in the world and has installed a new fuel system on Drew’s Harley and feels confident that he can give him all the horsepower he needs. In finishing, Matheson said, “I say bring it on. I love nothing better than racing against the best”.